A major driver of rental demand in Birmingham has been, and will continue to be, education. 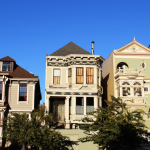 A dramatic restructuring of certain school districts in the area has increased property values. Additionally, over the past five years, the undergraduate program at the University of Alabama at Birmingham has expanded more than 10% to include nearly 12,000 undergraduate students. This increased enrollment coupled with the high rate of employment that the university and adjacent hospital maintain, are also drivers of rental demand in the region. An additional factor affecting rental growth in the area is the plan for the one million square foot Grandview medial center. This campus, slated for completion in the fourth quarter of the year, is predicted to bring hundreds of jobs to the area. While the Birmingham region is traditionally know for lower home prices compared to other major cities in the U.S., there are still plenty of opportunities for investors to turn a profit. 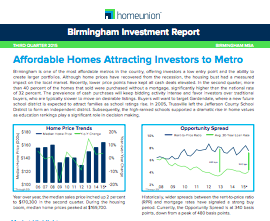 Download the latest report complied by HomeUnion®’s Data Services Team to learn why Birmingham has investment potential.